The data, measurement, and analytics firm EDO says it has raised $12 million in a funding round intended to help it scale its TV and video analytics platform. The company, cofounded in 2015 by actor Edward Norton and the tech entrepreneur Daniel Nadler, works with TV, media, and advertising companies to analyze TV ad campaigns in an effort to improve efficacy and targeting. The company subsequently brought on Kevin Krim, the former head of CNBC Digital, to serve as EDO’s CEO. “Kevin clearly saw the problems of TV’s reliance on simple exposure-based measurement and knew from his digital advertising experience what it could be,” Norton says. EDO currently analyzes every ad that airs on live TV. Krim tells Digital News Daily EDO has amassed a database of some 47 million spots, going back a few years. It then applies other datasets and machine learning to measure consumer intent. 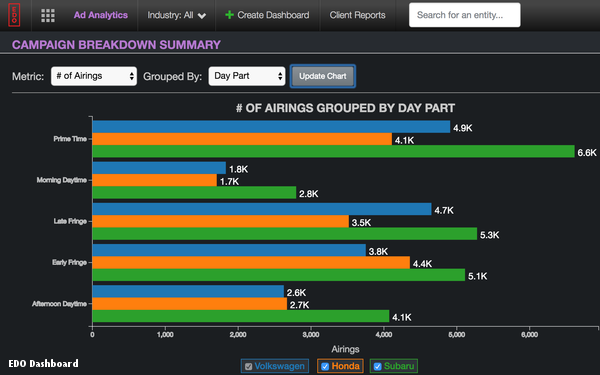 “When you build up that kind of dataset, you can do interesting data science that allows you to give marketers real-time clarity about their TV campaign’s creative and the stations they run on. [We show] how they are individually driving performance into the purchase funnel for that brand or product,” Krim says. Krim gave the example of one auto manufacturer that was about to launch an eight-week campaign. It tested six different spots over a long weekend. EDO found a few spots generated significantly higher engagement than others. If the buys were weighted toward those spots, it could generate the equivalent of 240 extra prime-time ads. Clients can access the real-time data on a software dashboard, or through other delivery methods like email. While the company has primarily worked with buy-side clients, it has since started working with sell-side clients as well, to help determine what programs and spots are most effective. The company plans to use the new funding round to scale its national sales to try and reach all of the advertisers that currently advertise on TV, and to “build new datasets around how consumers are engaging around non-live TV ads,” Krim says, specifically around video on demand (VOD) over-the-top video (OTT) and addressable TV advertising. The new round is being led by Jim Breyer and his and his venture capital firm Breyer Capital. Ultimately, the company wants to bring together the power of digital advertising with the reach and scale of TV advertising. With traditional linear TV being disrupted by data-driven dial players like Netflix and Amazon, and tech giants like Google and Facebook, the opportunity was there for a data-driven platform for these more traditional platforms. 1 comment about "EDO Raises $12M To Scale TV Analytics Platform". Ed Papazian from Media Dynamics Inc, November 1, 2018 at 12:16 p.m.
Alex, this is very interesting----but how, exactly, does this system determine whether one ad is more effective than another? Is it based on time on screen for digital buys?Or click throughs? Or online sales? What metrics are used for linear TV exposures---the vast majority of the "impressions"---as none of the standard digital metrics are available?Or is it all based on digital video findings?